It had a special meaning for one particular parade marcher, according to the article by Tribune reporter George White. G. A. R. stood for Grand Army of the Republic, a fraternal organization for union veterans of the Civil War. Winscott was also among Union veterans onstage for a commemoration of Abraham Lincoln’s birthday at the Strand Theater in February 1918. A copy of an index card from the National Archives showing Winscott’s pension history. That card seems to show that he actually never rose above private. But the fact that he received a pension in 1887 affirms that he was injured while in service, because only injured veterans could qualify for pensions at that time. Embellishment of his rank might perhaps reflect a somewhat itinerant family background. While he was born in Missouri, his family lived in Iowa and Illinois in his youth. After his war service, young James went on to live in Texas for a time. 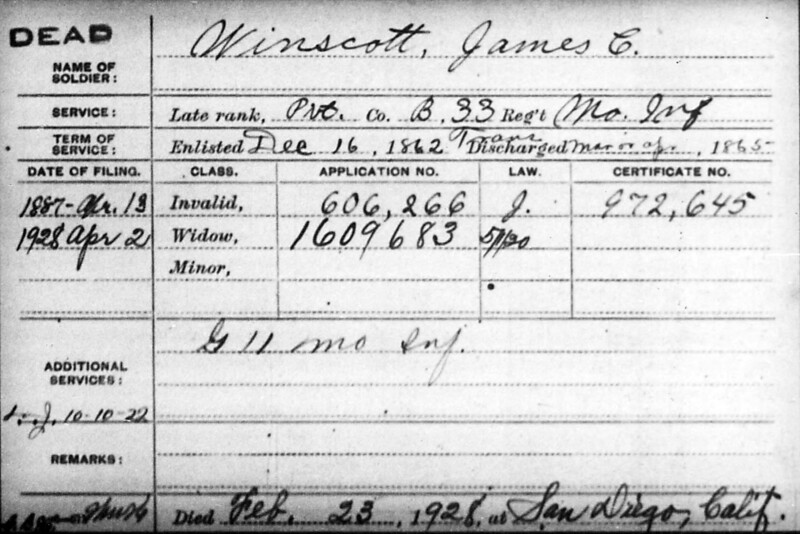 We do know that after coming to San Diego in the early 1900s Winscott periodically had to be admitted for treatment at the local branch of what were then called National Homes for Disabled Volunteer Soldiers. San Diego newspaper accounts show Winscott working at carpentry and other odd jobs at least into his mid-seventies. He died in San Diego on February 24, 1928 at the age of 82.